The latest compact camera from Samsung, until now a brand more associated with cheap consumer units, looks interesting. The Samsung EX1 seems to be targetted at the niche at the top end of the compact market currently held by Panasonic's DMC-LX3; it has the solid metal body and large image sensor (1/1.7", with only 10 megapixels), and trumps the LX3 by having a f/1.8 lens (to the LX3's f/2.0, to say nothing of Canon's G11, the lowly f/2.8 aperture of whose lens borders on insulting), a fold-out screen (just like the PowerShot G series had back when it was good, only this one's AMOLED). It doesn't have the LX3's range of manual controls (the aspect-ratio and focus mode switches on the lens barrel), and appears to have fewer aspect ratio options, but the quality is said to outperform the LX3. This afternoon, courier arrived bearing a small box from "Syncreon Technology", which, according to the postcode, appeared to be located in an industrial estate in Hinckley, Leicestershire; it was labelled with "No Delivery To Neighbour" and the contents were described as "Electronic Parts". On opening the box, I wasn't particularly surprised to find that it contained a new iPhone 4. It seems that Apple went to the trouble of setting up a front company, with an office somewhere nondescript, in order to avoid units from the first batch being stolen. You've probably seen the reviews of the iPhone 4. All things considered, it is a beautiful piece of hardware. The screen, with its tiny pixels and rich contrast and colour depth, looks like backlit slide film or luminous magazine print, and the build quality of the unit feels solid in a way that few mobile phones do. Meanwhile, iOS 4 is very responsive on it. There may or may not be an issue with antenna sensitivity and reception (some users have reported their iPhones losing bars of signal when they touch the steel frame, which doubles as the antenna, and its signal reception fared worse than that of a 3G data card, the only thing I could compare it to on the Three network), though it seems to get acceptable signal so far. Meanwhile, the (rear) camera seems to be a great improvement over the previous one. I have transferred my data from my old iPhone 3G (one I bought on eBay earlier this year as a stopgap device) to the new phone and played with it a little, though, so far, I'm pleased with it. It'll probably become even more impressive as apps start appearing that take full advantage of its capabilities. Well, here it is. Apple have just announced their next iPhone, the iPhone 4, and it does impressive. The screen resolution has been quadrupled, to 640 by 960, with the effect that the pixels are too small for the human eye to resolve individually. The new iPhone also has two cameras, one front-facing and one rear-facing, and does video calls. Aware of the party-photo market, Apple have optimised the main camera for low-light performance, adding backside illumination (which, given Apple's squeaky-clean policies, is not as indecent as it sounds) and thoughtfully avoided cramming in more pixels. (Before you ditch your LX3, though, remember that it's still a phone camera; the pixels are still much smaller than in a compact, and the lens system is rudimentary. I'll bet that Hipstamatic looks sweet on it, though.) It can also shoot high-definition video, and Apple will be making an iMovie application available for it, for shooting and editing video entirely in the phone. (I wonder whether the microphones are any good in loud environments; if they don't distort like those in every compact camera I've seen, it may be good for recording gigs.) Furthermore, the iPhone 4 adds to its compass and accelerometer a 3-axis gyroscope, giving it similar motion-tracking capabilities to what the Sony PS3's Sixaxis controller and Nintendo WiiMote have). And then there's the impressive-looking build of the unit, with its machined steel frame and ultra-durable glass panels. Anyway, here is Apple's page on the design of the new iPhone. I wonder whether they'll rename the iPhone 4 in Asian markets, though; the number 4 is considered unlucky in China and nearby because, in Chinese, it rhymes with 'death'. To wit, other companies like Canon skipped version numbers when hitting their fourth iteration. A few years ago, Yamaha released the Tenori-On, a radically designed electronic musical instrument in the shape of a tablet covered with a grid of lighted buttons. 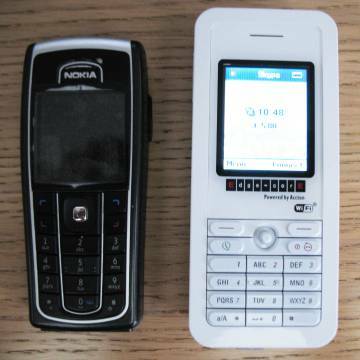 The problem with was the price: at US$1,200 (or around £700), it was only affordable to those with deep pockets. Now, Yamaha have announced a more affordable Tenori-On. The TNR-O (the 'O' is for 'orange') differs from the premium model in that it lacks the grid of lights on the back (so your audience can't see the nifty patterns of light it's making), and the magnesium casing has been replaced by a moulded orange plastic case; otherwise, it does exactly the same thing. How much more affordable it will be is not yet known, though rumour has it that it may not be much cheaper. Perhaps someone can persuade Yamaha to port it to the iPhone or some similar gadget (the rumoured Apple tablet would be a natural platform), in the way that Korg have ported their MS-10 modular synth to the Nintendo DS. It's made of plastic, Nintendo-white, with rounded buttons and a colour OLED display, and works as a controller for music software and a standalone synthesiser/sequencer. It's still under development, by an outfit named Teenage Engineering (who appear to be a bunch of Stockholm hipsters, with a tendency to use conspicuous Japanese translations on their web site; they also make modular studio lights and downloadable papercraft models of Yamaha motorbikes). The product is said to be 10-12 months from release, with no price yet known. Beleaguered PDA maker Palm, who brought us the Pilot/PalmPilot and its descendants, has been having a rough time of things; PDAs have largely gone extinct, and their PalmOS (which, technically speaking, was rather like MacOS 9 in a lot of ways) was looking a bit long in the tooth compared to other phone OSes; Palm acknowledged this and deprecated it in favour of (of all things) Windows Mobile, becoming just another Windows phone vendor. And not a very competitive one, it would seem; their market share all but disappeared, and they looked to be circling the drain, as everyone ditched their Treos for BlackBerries or those Apple things they've been going on about. There were rumours of a new operating system they were working on, but as the months and years passed with no sight of it, a revival of their fortunes started looking much like the mythical second coming of the Amiga. But now, it's here, or at least on the horizon, and it's looking rather good. Here is the report of the CES press conference. Basically, it's a rather nifty-looking handset with an iPhone-like multitouch screen and a slide-out keyboard and it runs a new system named Palm WebOS, which is based on a Linux core but seems to take a quite interesting data-driven approach. The user interface and other performance appears to be very polished—some would say better than the benchmarks set by Apple, which are indeed high—and, to top things off, it comes with a nifty contactless charger known as the "Touchstone". And, as they made a point of mentioning, it has both a removable battery and cut and paste. The US version is, as always, exclusive to a carrier (Sprint, in this case), though a GSM 3G version for non-US markets has been announced. In general, the commentariat are impressed. Needless to say, Palm's stock is recovering nicely. I recently bought myself a Korg NanoKey. 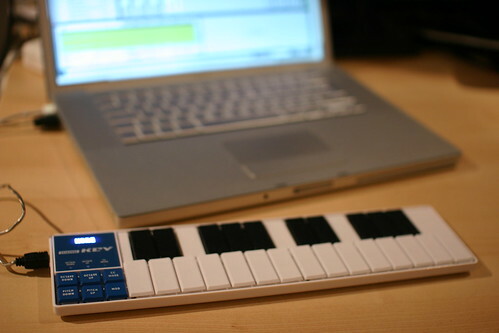 That's a tiny USB MIDI keyboard, about the width of a low-end MacBook, with two octaves of plasticky-feeling keys. The NanoKey has received mixed reviews, with some admiring the concept and others complaining at how cheap it feels. I've only been using it for a week or so, but I'm extremely pleased with it. For one, it's tiny, which makes all the difference. It fits comfortably in a laptop bag, and is small enough to get out and use anywhere; I can take it out in a café without looking like some kind of attention-seeking weirdo, or even use it on a train (these have both been tested; the last one, in economy class aboard the Eurostar). Or, I can place it unobstrusively on the desk. The convenience factor is a big win; in contrast, I also have a 25-key Evolution MK-425C, which is about the size of a backpack, and has been gathering dust for ages. Of course, as you can probably guess, the NanoKey is thin and plasticky. If you're guessing it feels cheap, kind of like a child's toy piano, you'd be right. No-one will mistake it for a Steinway grand any time soon. Though, given the convenience, that doesn't matter; it works well enough for what it does, which is sending MIDI notes better than the QWERTY keyboard. And furthermore, it is touch-sensitive; I was quite surprised to find this out. 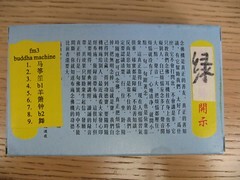 It also came with a download code for the cut-down edition of Korg's M1 softsynth. Which is great should I ever need an Italo-house piano or similar. The upshot of this is that I've been playing with music more, and when I do, in a more hands-on way; actually playing notes, rather than clicking and dragging. In any case, it was probably the best £45 or so I've spent in a long time. Back in May of this year, Sony told the WSJ that free engraving had recently saved them a million dollars. Canon have announced the next crop of PowerShot cameras, at least in the A and S series. As expected, they're still running the megapixel race hard, cramming more and more increasingly tiny pixels into a pocket-sized sensor to give the public excitingly bigger numbers, whilst ignoring the growing chorus of criticism that more pixels aren't better. So when you buy one and realise that your new 10-megapixel photos look like crap compared to the old A570IS you just replaced (which didn't look that crash hot when compared to the silky-smooth dynamic range from your ancient 4MP PowerShot G2), you'll know why, and wish you had gone and bought a camera with fewer pixels. Well, if they actually still made them, that is. You can blame the gullible idiots who are convinced that more pixels is better, have no idea of esoteric concepts such as "noise" or "dynamic range", and will rush out to buy anything with a higher pixel count, dooming any compact camera with fewer, decent-sized pixels to certain death in the marketplace. Though you'd think that there'd be enough people with a clue and a demand for a high-quality pocket-sized camera with the right compromises made in its design parameters to give the best (as opposed to biggest) images you can expect from that size, for Canon (or someone) to bother making such a line. 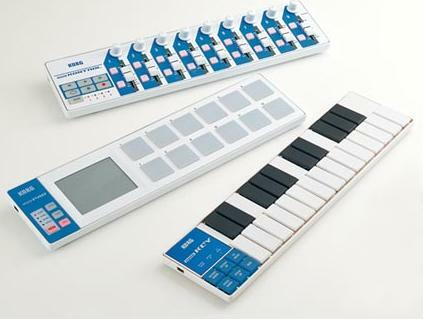 It's about time somebody did something like this: Japanese synth maker Korg have announced a series of laptop-sized USB music controllers. The nanoSeries, as they call it, includes a 25-key MIDI keyboard, a 12-pad drum controller with X/Y pad and a mixing controller with 9 faders, 9 knobs, 18 switches and transport controls; all of these will be about 13 inches in width and will come with download codes for light versions of music software; according to these UK retailers, this series is expected to arrive in October 2008, costing between £49 and £59 each. Japanese synth manufacturer Korg have announced a Nintendo DS emulation of their MS-10 semi-modular synth. (They're those small L-shaped ones with the patch cords you sometimes see at gigs.) The Korg DS-10 is being developed by AQ Interactive, and will be released in July 2008, though only in Japan. From the screenshots, it appears to be labelled in English, so ¥4,800 could get you a usable copy. Two artists have created a device for manipulating fonts as one would synthesiser sounds. The Meek FM Typographic Synthesizer consists of a box of synth-like knobs connected to a Mac running software which allows the user to tweak aspects of a font using the knobs. (The font is stored in a higher-level representation, consisting of strokes, though it's said to be able to import standard PostScript fonts.) There's a video of it in use here. Possibly following the rise of Balkan folk-influenced indie bands, Roland have now released a MIDI accordion. The Roland FR-2 V-Accordion® uses physical modelling to reproduce the nuances of sound (including valve and button noises and the sounds of individual reeds) and comes with 8 accordion sound sets, as well as 6 orchestral sound sets, and 15 microtuning presets. As I type this, Steve Jobs is giving his keynote speech at MacWorld. From what I can tell, he has announced a few consumer gadgets (an improved AppleTV with movie rentals (presumably in the US only) and Flickr support, iPhone and iPod Touch firmware upgrades) and a wireless Mac backup appliance named "Time Capsule". Mind you, Engadget's feed doesn't seem to be coping with the load of millions of Maccies across the world constantly hitting reload to see whether any new tidbits have appeared, and Gizmodo's feed, while more reliable, seems a bit lighter on content. It'll be interesting to see what the "one more thing" is, whether it's a solid-state, Asus Eee-sized MacBook named "Air", or whether all the rumours were all off. The presence of Hollywood heavyweights and mention of Blu-Ray is ominous; given Blu-Ray's strict licensing conditions, any Mac with Blu-Ray would have to have the same onerous internal DRM surveillance infrastructure as Windows Vista, with the same fragility, loss of performance and the actual user generally getting the rough end of the pineapple. Update: Nothing about Blu-Ray; though the Another Thing was, in fact, the MacBook Air, a ridiculously thin 13" laptop. They have now built a better mousetrap: a miniature gas chamber which asphyxiates the mouse, and sends a text message confirming its death. 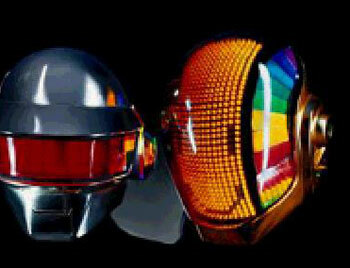 Want some authentic Daft Punk robot helmets? That'll be US$65,000 and one year. Oh, and you'll need a license from the band. Also, be aware that they don't run on batteries, so if you want to wear yours with the lights running, you'll have to do so whilst tethered to a power cord. Hot on the heels of the TrollTech Greenphone, a company named FIC is releasing an open-source, Linux-based mobile phone. The OpenMoko won't have WiFi (as the GreenPhone will), but it will have a GPS receiver built in, as well as Bluetooth, USB, a MicroSD slot and a multi-touch touchscreen capable of understanding two-fingered dragging gestures. More importantly, it's not so much a mobile phone (which is to say, a locked-down proprietary appliance) as an openly hackable general-purpose computer with a GSM module and GPS receiver attached. (The radio components are, for regulatory reasons, closed modules; everything else, though, is fair game.) And apparently it will have a Debian-style package management system built in which can download new (or updated) software components on demand. And, also unlike the Greenphone, it will be released to the mass market (they say in January, which could mean sometime in the first half of 2007). 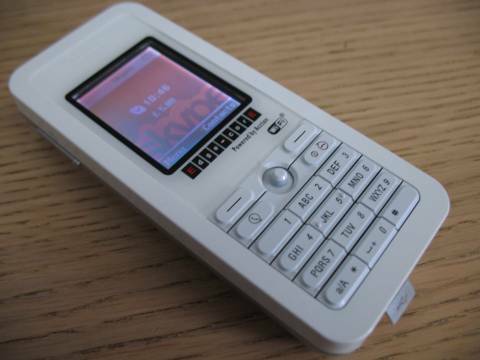 I recently acquired one of the newly-released WiFi Skype phones; in my case, I went with the Edge-Core WM4201. I ordered it in August or so, but it only arrived this week; I suspect this may be connected with the other Skype phones (the Netgear and Belkin ones, for example) not being released in Europe until October. Getting started with the phone is straightforward; let it charge for a while, and then turn it on and let it find a network. (The instructions advise to let it charge for 8 hours before using it. I was somewhat impatient and switched it on an hour or two into its charging; this does not seem to have affected battery life or performance.) It can do WEP and WPA, so locked networks are OK; however, it doesn't have a web browser, so you're out of luck at access points that require web-based authentication. It then logs into Skype, fetches your contact list and balance, and is ready. It also gets the current time from the internet, though can take a few minutes to do so; so if your phone is telling you that it's 00:02 on January 1, 2000, there's no need to manually change this. Which is just as well, as the date-setting user interface is somewhat counter-intuitive. As for making and receiving calls: the quality is pretty much standard Skype quality, i.e., good enough save for the occasional choppiness and echo. It only does voice calling as well; there is no way to send or receive text messages on it. Perhaps this will arrive in a future version of the firmware? As this phone is a 1.0 product (1.0.0.10, it says), there are still some rough edges. For example, sometimes when it loses the wireless network, it crashes and becomes unresponsive, requiring you to remove and replace the battery to reset it. (The manufacturer seems to have neglected to provide the usual paperclip reset switch.) This only happens when it's running off battery power; leaving it plugged into a USB cable seems to make the problem go away. Also, on one network I tested it with, the phone kept losing the network connection every few minutes, though only when not making or receiving calls. Hopefully these issues will be fixed in the future. All in all, I'm quite happy with the phone. It allows me to be reachable on Skype and make and receive phone calls without being near a powerful headset-equipped PC. It is usable as is, though there is room for improvement. One question I have been wondering about: what exactly is the Edge-Core WM4201? The information page of the firmware reveals that it is implemented using TrollTech's toolkit (presumably Qtopia), which means that it's probably not a Windows CE device (after all, one wouldn't pay royalties to Microsoft and then avoid using their technologies). I suspect it runs on either Linux or some embedded system like QNX. The phone has a USB port on the bottom, though, disappointingly, there is no evidence of the data lines of this being connected to anything; connecting it to a computer reveals no new devices plugged in. It seems that the USB port is just used as a relatively standard way of feeding 5 volts to the device. The phone appears to be firmware upgradeable, though it does this by itself checking for updates on the internet. I don't know what URL it pings to check for new firmware; I wonder whether it pings an Edge-Core URL for a version of the firmware specific to Edge-Core hardware, or a skype.com URL for upgrades to any WiFi Skype phones. 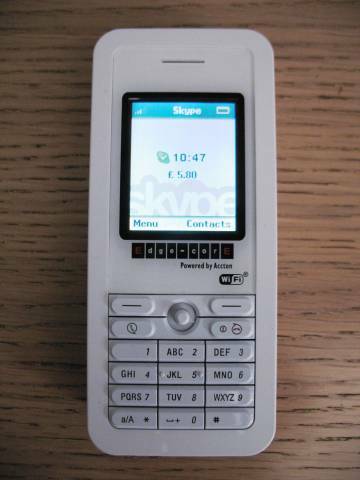 I have seen photographs of other Skype phones, and they look similar, both in layout of buttons and the user interface. Could it be that Skype handed manufacturers a standard hardware platform and just makes a release of their software for this? If so, the differences between rival models would be limited to things outside of the reference design, such as quality of screens/keyboards/speakers and charging solutions. Fifth, excessive jazz, blues, or classical music. Surprisingly, many (N.B.) single males fail to understand that the reason Pop Music is called "pop" is because it is popular. Showing your well-roundedness is good, but copying all of your unmarried uncle's extensive jazz collection onto the iPod will not make her think that you are Sophisticated, but that you are balding. If there was the slightest chance you could get laid in today's market by owning a Sonic Youth ceedee, there would be far fewer former record store clerks making mySpace pages. Seventh, anyone who can listen to Nick Cave for more than a half hour at a stretch is mentally ill. Which assumes that the object of one's affections has mainstream tastes; then again, as does the compiler of the iPod's contents (for example, it cautions against putting on jazz, blues or Nine Inch Nails, but doesn't mention more esoteric pitfalls such as krautrock, micro-house or Merzbow, which could be just as alienating, unless perhaps you met on the ILX forums). You weren't seriously thinking of a Shuffle, were you? Come on! If a Shuffle would work you might as well just offer her the rest of your bag of Dorito's and take off your pants. Let not the dying battery, cracked screen, or sputtering disk drive end up being a metaphor for the failures of your relationship. Hewlett-Packard is doing its part to tackle the affluent world's obesity crisis—by developing a digital camera that can make photographic subjects look slimmer. Gizmodo reviews the Belkin WiFi Skype phone (which doesn't appear to have a UK release date, though review copies have been floating around; the BBC Click Online presenter had one a few weeks ago, though didn't say much about the specifics). From the review seems generally pretty good, if somewhat limited (it doesn't do text messaging, only voice calling). . I wonder how the others (such as the Netgear and Edge-Core phones, or even the BCM Skype/SIP/MSN phone which may or may not be vaporware) will compare. And another (vaporware) Wi-Fi Skype/VoIP phone has been announced: the Edge-Core WM4201, like the BCM and Netgear Skype phones announced before it, is said to ship in July 2006. As with the BCM phone, there is no sign of anyone preparing to sell these to consumers. Nintendo have announced a microphone/headphone headset for their DS handheld game console, intended for use with games allowing voice communication between players. Though perhaps that's only the start; were Nintendo to bring out a VoIP package for the DS, it would turn the WiFi-enabled pocket game console into a reasonably useful internet phone. Given that a version of the Opera web browser is about to come out for the Nintendo DS, it's not entirely implausible to imagine Nintendo doing a similar tie-up with Skype (or perhaps Google Talk), or else bundling a standard SIP client with their handheld. Looks like there's another WiFi-based, standalone cordless Skype phone coming out; unlike the Netgear and Belkin offerings, this one will hedge its bets and speak both Skype and SIP. It also does text messaging, which the Netgear phone may or may not do. The PDF files on the manufacturer's web site say that the phones are firmware upgradeable through a USB serial console. I wonder whether they run something standard like Linux, and if so, how hackable they are. If would be rather cool if it were possible to add third-party extensions to the interface (for example, a version of Gaim, or even the promised Linux port of Google Talk). iRiver, the Korean MP3 player manufacturer started off making players that were USB mass storage devices; in other words, when plugged into a computer, they looked like a hard disk you could copy MP3 files to, which the device could then play. A while ago, seemingly persuaded by Microsoft, they abandoned this and replaced it with something called MTP, a proprietary Microsoft protocol for transferring audio files, which officially only works with Windows Media Player (sorry, Maccies and Penguinheads!). Now they seem to have realised the error of their ways (perhaps spurred on by other player makers, such as iAudio, proudly advertising that their devices look like standard USB hard drives that work with anything), and released a firmware update which lets users choose which USB protocol their player uses; for some of their players, at least. The latest gadget on the Japanese market is a gun that fires teddy bears, fitted with parachutes, into the air. The necessity that mothered this bizarre-sounding yet oddly compelling invention was the fashion in Japan to throw teddy bears, rather than bouquets, into the air at weddings. The teddy bear gun merely automates this process somewhat. "The falling value of electrical goods means housebreaking no longer makes sense. Even the simplest of criminal minds will carry out a risk-benefit analysis,"
He said: "There's no doubt the falling value of electrical goods has made housebreaking a less attractive crime. You can buy a new DVD player in Asda for about 20 quid, so there is no longer the same market for stolen goods. Dr Cook added: "If you really want very cheap second-hand goods, they can be bought at money lender or cash-back places and are definitely not stolen. Second-hand stolen goods can't compete with that." The other side of the rise of miniaturisation and integration is that, with people carrying more valuable high-tech gadgets on their persons, street mugging has become a lot more profitable, and consequently increased. 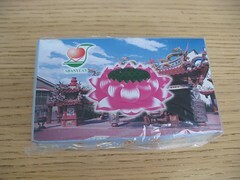 A package just arrived in the mail, containing a Buddha Machine. For those not familiar with the Buddha Machine, it is a small plastic device, about the size and shape of an old-fashioned transistor radio, which plays several loops of what sounds like minimal electronic ambient music, through a built-in speaker or headphones. It was designed by two artists from Beijing's electronic-music underground, Christiaan Virant and Zhang Jian. Built in Chinese factories (though what isn't these days? 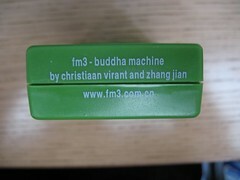 ), the Buddha Machine proudly embodies a made-in-China commodity-gadget aesthetic. It comes in a box decorated with lotus flowers, Buddhist swastikas and a photograph of a temple, and looking more like it would hold patent medicines than consumer electronics. 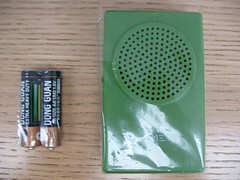 The box contained two AA batteries (designed to resemble Duracells, only more cheap-looking) and device itself. 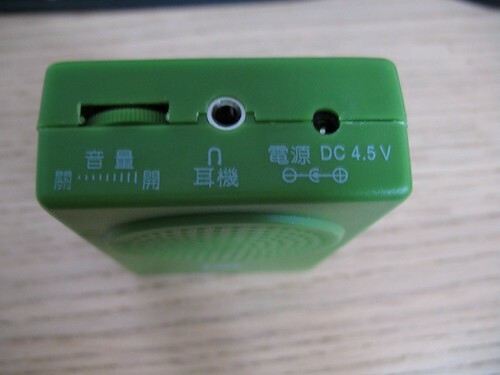 The device made of thick plastic, its pieces fitting together slightly roughly (no iPod sheen here), and all the labels are exclusively in Chinese, with the exception of the creators' URL on the bottom. The Buddha Machine comes in six colours, though there is no means of choosing one; they are distributed at random, and which you get is the luck of the draw. Mine was green. When switched on, the device plays a randomly-chosen loop through its speaker or the headphones. It has a small, ordinary-looking switch on the side; when this is flipped, it changes the loop to a different randomly-selected one. (It has 9 built in.) The loops come from performances by the two artists, and are stored in memory on the device. They sound, in a word, ambient, varying from glitchy, saturated chords and slowed-down instrument sounds to minimalistic micromelodies played on a variety of lo-fi drones and distorted string-like instruments, to what sound like fragments of larger works, chopped out of their context and fashioned into textures. The loops are chosen at random; flicking the rather ordinary-looking switch on the side of the unit switches to another loop. It is probably a cliché to describe it as "oddly soothing", though the effect is. And here is an interview with the creators, describing how they came up with the idea, and how surprised they were to sell as many as they have; they had expected to sell a few hundred, but then various bloggers and hipsters (notably Pitchfork Magazine) picked the Buddha Machine out as a techno-fetish object to file alongside their Lomo ActionSamplers. In the middle ages, it was the done thing to possess mementi mori, artefacts to remind oneself that life is fleeting and death is inevitable. In 1991, a gentleman by the name of David Kendrick took out a patent on a modern-day equivalent, a wristwatch that displays the (estimated) time one has left to live. It may not surprise anyone to know that this was mentioned on Proceedings of the Athanasius Kircher Society, a veritable wunderkammer of the outré. This looks fairly interesting: a Taiwanese company is bringing out Flash-based MP3 players with built-in Sega games. The Lavod PocketPlays will come preloaded with 10 or 20 Sega titles, and have TV output for playing them on a television. Other than that, little is known about them, except that one of them will have a SD Card slot and USB 2.0 port. The Kuku Alarm Clock greets you every morning by crowing and laying eggs. It won't stop chirping until you've returned its eggs. The Blowfly alarm clock escapes from a cage in your room, moves and produces sound around you when the alarm goes off. To turn it off you have to catch it and put it back in its home. A hardware hacker with a very steady hand builds a head-up computer display into a pair of slim-line sunglasses. His ultimate goal is to fit sunglasses, a video camera and a microphone, covertly, into what looks like an ordinary pair of sunglasses, effectively making a Snow Crash-style gargoyle rig (just add a wearable computer). The Nokia 770 Internet Tablet, a hand-held, Linux-based, WiFi- and Bluetooth-enabled web-browsing/email appliance, is out. In the UK, it's selling for £245, and appears to be out of stock already. It costs twice as much as the other hackable, Linux-based gadget, the GP2X, though has wireless communications technologies (which the GP2X lacks altogether) and more than four times the screen resolution; however, external storage is limited to the smaller RS-MMC cards, as opposed to the somewhat larger SD cards the GP2X takes; also, while it's likely that someone will port MAME to it, playing arcade games with the nagivation pad probably won't be as comfortable as with the GP2X's controls. I'd have one of each, had I £370 I had no better use for and a jacket with infinitely capacious pockets. And here there is a round up of reviews of the Nokia 770. Never mind the PSP, I want a GPX2. It's a pocket-sized SD-based media player (capable of playing DivX/MPEG4 movies and MP3s) and some undefined games (with the provided joystick). Most interestingly, it runs Linux; assuming that they don't deliberately cripple it, that means it's going to be possible to put MAME on it, load up a SD card with old arcade ROMs and have an arcade in one's pocket. The only thing it's missing is WiFi. This looks interesting: BlackDog appears to be a device the size of a USB flash drive containing an entire Linux-based computer. Plug it into a PC's USB port and it appears as a network-connected Debian box, and auto-runs an X server to connect to the machine in question (this is presumably on Windows). It also includes a "biometric reader" to control access to it. And then there's the Neuronium. An eye-catchingly blue box hand-built by a German vintage synth designer, it looks like some kind of dance-techno sample-synth module or virtual analogue synth, but is basically an analogue neural network for generating vaguely Tangerine Dream-esque electronic burbling noises. If you have €2499 to spare, it could be yours. Not sure what to put in the remaining 5¼" drive bay of your souped-up PC, next to the DVD rewriter, 50-function fan-controller/card reader and graphical status display? How about an audio cassette deck. It plugs into a serial port and your sound card through a breakout box, comes with Windows software for controlling it and recording from/to audio cassettes, and can be yours for a mere US$149 (from ThinkGeek, not surprisingly). The first MP3 player I owned was an Archos Jukebox Recorder. This was a relatively bulky unit consisting of a low-power CPU, monochrome bitmap display and notebook hard drive (20Gb, though it was easy enough to open it up and swap the hard disk for a larger one, at least until Archos started soldering their hard drives into cages of circuit boards). Just under a year ago, I bought an iRiver H340; this is a smaller unit, with a more powerful CPU (Motorola ColdFire; it's powerful enough to decode MP3 and OGG in software, and someone has gotten an iRiver emulating a GameBoy), a colour display, two USB ports (device and host), and based around a smaller (1.8", i.e., iPod-sized) hard drive. Like the Archos, it could record to MP3, from a (crap) built-in microphone or line in (I think it even has a microphone preamp built in, unlike the Archos). However, it seemed to have one crucial missing feature: no real-time clock. Why is that such a big problem, you ask? Well, when you suddenly record something on the go, how will you know what it is that you recorded later on? The files it makes are named VOICE001.MP3, VOICE002.MP3 and so on, which doesn't say much. There is no keypad, touch screen or other data-entry method to give them names either. Of course, if the device has a real-time clock, you can look at the timestamp of the file to see when it was recorded, but with no such clock, all files created get an arbitrary creation time such as midnight on 1/1/2002, so you're left guessing. Mind you, now it emerges that the H340 hardware does have a real-time clock, just that the firmware didn't use it. I just found out the most recent firmware upgrade adds a clock function, displaying the current time, and adding sensible timestamps to any files recorded. Which makes the iRiver slightly more useful for things other than listening to music. 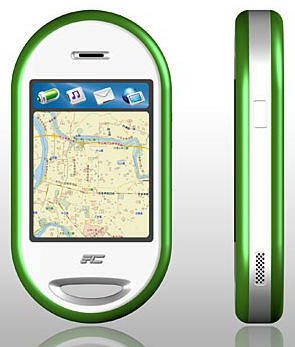 The latest mobile phone approved in the US is shaped like a Coca-Cola can, and has three buttons. One connects the caller, who has just found the device in a 12-pack, to a Coca-Cola representative who explains that they have won that most American of aspirational lifestyle symbols, a SUV; another sends the caller's whereabouts, picked up by a GPS receiver built into the device, to the company so that the lucky Coke drinker's SUV can be delivered. The device was developed by a Sydney company, Momentum Worldwide. This looks simultaneously nifty and obscene (disposable single-use electronic devices used for promoting junk food and giving away SUVs and then destined to leach toxins into the water table). This lends itself to speculation about risks, and ways in which the street may find its own uses for these. The devices would probably cost a few hundred dollars to manufacture, and Coca-Cola would probably collect them for destruction upon delivery of the SUV. Though if one got one and didn't want to own a truck, I wonder how easy it would be to remove the SIM card and fit it to a different phone. Unless SIM cards can be configured, at the network level, to only call one number, an aspiring terrorist or troublemaker could have in their hands a completely anonymous SIM card, courtesy of Coca-Cola. Chances are it'd only be good for one call and one SMS message, though; I wonder whether it could receive calls. The Archos Gmini units look really nifty. As long as they are USB Mass Storage devices, and don't need any proprietary Windows-only "media manager" software to upload MP3s (and manage your unwieldy collection of digital rights). It'd be interesting to get a closer look at one of these; on the website, it looks fairly promising, just from the specifications and screenshots. Though so did the Agenda VR3 Linux-based PDA, which turned out to be half-baked and next to unusable, once the novelty of calling up a UNIX shell on something without a keyboard wore off. The latest thing out of Japan: rubber duck-shaped USB flash drives, in a choice of three pastel colours. They don't play MP3s, they don't clip onto a keyring, they have a great unwieldy USB plug sticking out of them, they probably don't take kindly to water, and they're only 16Mb in size. I'm sure that it makes sense to someone, though. This sounds interesting: A new MP3 player from Archos, the Gmini, which is claimed to be the smallest 20Gb MP3 player in existence (which means it's probably based on one of those 1.8" sub-notebook hard disks). The interesting part is that it will work with plug-in accessory modules, including a voice recorder, a photo viewer and music composition software (which could be anything from a glorified ringtone composer to a Cubase-like studio package to a loop-based dance-music production toy). First there were pocket-sized USB flash disks, then USB flash disks with built-in MP3 players (for those whose music collections fit in 128Mb), and now, if an ad on the front page of the Computer Trader (a cheaply printed monthly paper of classifieds and price lists) is to be believed, there are USB flash disks with text-to-speech. It doesn't say exactly how it works, but I presume that you copy text files to it and it reads them to you while you drive/jog/catch the bus. Which could be useful, depending on other things (i.e., how listenable the voice used is, how easy it is to navigate through texts, what file formats it can read (plain text? MS Word? Unicode?). The Guardian's roundup of new hard disk-based MP3 players, competing with the iPod (stocks of which have been sold out across both the UK and US). The Archos unit looks interesting (though chances are there's no third-party firmware for it; hope Archos have lifted their game in that area; also, it seems that Archos haven't updated their Jukebox Recorders with disks larger than 20Gb; for anything bigger you need to buy the more expensive MPEG4 video jukebox), and the Rio Karma also looks like it could be good. It's also interesting to see that the drugmusic empire Ministry of Sound have their own branded product in that particular market. As a society, we discard an alarming amount of electronic equipment. It has once been claimed that the average PC has a working life of just under 3 years before it is consigned to the landfill, usually still in working condition. Meanwhile, we toss our old mobile phones as soon as the coltan to make new ones is mined from Congolese national parks. Not to mention all those electronic devices which are built to last a few years (my Sony stereo is a case in point; not to mention the fact that anything with firmware in Flash ROM is going to be scrap within a decade). So it's not surprising that the landfills are filling up with old computers, dead TVs and last year's DVD players, all of them leaching toxic chemicals into the groundwater. Recycling of electronic devices has been a dubious exercise, with horror stories of entire Chinese villages serving as computer graveyards, young children picking futilely through mountains of dead circuit boards, and everybody getting cancer and dying before their time. But the urbane, left-leaning westerner who sent their old Pentium to be recycled (and paid the surcharge for doing so, lining the pockets of the growing guilt-assuagement industry) doesn't see any of this so their social conscience is eased. Perception is everything. Glass in television sets is carefully dissected with Matsushita's own breed of cutter to keep the toxic leaded glass in the rear portion away from the safer glass in the screen. The result is two kinds of glass that ends up in new TVs. Separating the different parts of a washing machine requires a complex arrangement of magnets and wind blowers to produce cleanly divided waste. It looks to be what amounts to an all-electronic set of bagpipes, i.e., a breath controller and synthesizer unit, which adds in user-adjustable drones. Apparently it's of German manufacture, has been around for some years, and is intended for people needing to quietly practice the bagpipes. Not surprisingly, the main market would be in the highlands. Apparently, it does MIDI, and if you run it through an amp, it sounds quite realistic. Is anybody else wondering what it would sound like through some effects pedals? I just picked up a Handspring Visor Deluxe handheld to replace my dead Pilot 5000. It was a choice between this one and the slimline Visor Edge, both heavily discounted, but I went with the Deluxe, because (a) the only advantage of the Edge is that it's slimmer and sexier-looking (not something I look for in a handheld computer), (b) this one was cheaper, and (c) I don't like the idea of a PDA with volatile memory running on an internal rechargeable battery (as those degrade over time). I recently got an Agenda VR3 through work. The VR3 is a PDA, a small device, physically not unlike a PalmPilot. The main difference is that it runs Linux; when you turn it on, you see the Linux boot messages scrolling past in a tiny font, and then the familiar X11 stippled background. There is also a Terminal application which gives you a UNIX shell (one of those tiny stripped-down rescue-disk shells, mind you; everything on the Agenda is done with economy in mind). How useful that is is another matter; the handwriting recognition system also seemed a bit slower and more erratic than the PalmPilot's (even than my aging Pilot 5000, whose digitiser seems to be going senile), making entering UNIX commands somewhat painful. The software built into the Agenda is what you'd expect: notes, address book, scheduler, &c. However, much of it is somewhat rudimentary compared to the Palm. For example, there is no way to tell the scheduler to display days from 2pm to midnight, rather than the hegemonic 9 to 5 of the Morning People who rule the world, and adding events means going through dialogs. The Agenda probably won't replace my aging Pilot; however, the fact that it's Linux-based and hackable raises some interesting possibilities. I was thinking that my next PDA would be a Psion, but now I'm thinking that one of these may be better. An industrial design student at Brunel University in Britain has designed a toaster which burns the weather forecast onto slices of bread. The device, programmed in Java, retrieves the weather from a telephone number (presumably by modem), and uses an 11x11 heat-shielding mask to print it onto the bread.